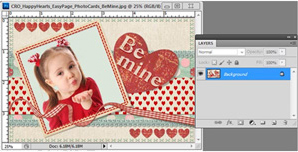 In this tutorial, you will be learning a quick and easy way to create a digital scrapbooking Printable Photo Card for Valentine’s Day. The Scrap Girls’ Boutique contains a category of products named Digital and Printable Cards and Crafts. 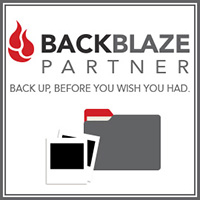 It is packed full of digital templates and ready-to-assemble products that allow you to easily create personalized gifts and cards for any occasion. 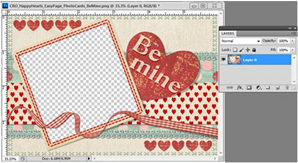 I want to send a Valentine’s Day photo card this year, so I am going to use Printable Photo Cards: 4×6 Happy Hearts. 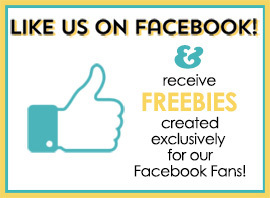 These Easy Page printable photo cards are wonderful because you simply add your photos and print or send electronically. 1. Start by choosing one of the PNG files and opening it using your photo editing software. I chose to open the file: CRO_HappyHearts_EasyPage_PhotoCards_BeMine. 2. Now that your file is open, insert your photo in the empty transparent box by clicking on the photo. 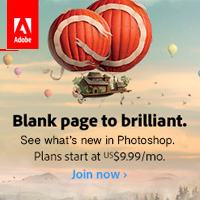 While holding down the mouse, drag the photo over to the card document and then release the mouse. 3. 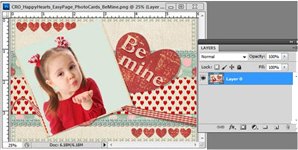 I want the photo to show through the transparent window, so I want to move the photo layer behind the card layer by dragging my layer down or by using the drop-down menu to select Layer> Arrange> Send to Back. If you need to resize your photo to fit in the window, you can do that by using Edit> Transform> Scale (in Photoshop) and hold down the Shift key while dragging the corners to keep the proportions the same. When the card is finished, I clicked File> Save As and changed the file format from PSD to JPG. The printable photo card will then be in a JPG photo file, and now I have plenty of fun options. I can print it out from home or I can send it off to the printer. I can post it on Facebook and also send it out as an e-card electronically. Gotta love that! Voila! In a matter of minutes, I’ve created a personalized, unique, printable Valentine’s Day photo card to send out to family and friends. It was fun, easy, inexpensive, and I know they will treasure it.